Why fish huddle together at the bottom of a garden pond? 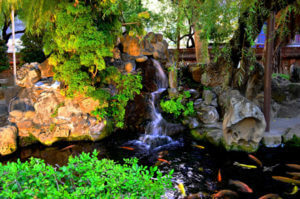 A fish pond is a dynamic environment with sun, wind, rain and vegetation all affecting the quality of water. The health of pond water is a main contributor as to whether fish will thrive or not. Goldfish are the most hardy of pond fish and will tolerate a certain level of algae-filled and muddy conditions. However, a cramped environment (number and size of fish relative to volume of water) causes stress as a result of increasing nitrate levels. To keep fish happy and thriving in your pond it is important to understand their behaviour at different times of the year. Doing this will help you to know what is normal behaviour versus a reaction to dealing with stress or change. Over crowding, a lack of oxygen, over-feeding and poor nutrition, are stress factors that may lead fish to huddle together at the bottom of the pond. In this article we explore four factors that adversely affect the well-being of fish. Fish have specific nutritional needs for good growth and bone development. Fish will soon recognise poor quality food and stop eating some or all at feeding time. Wasted food will sink to the bottom of the pond and decompose. Oxygen is taken from the water and used in the decomposition process. Noxious gases such as ammonia are then released into the water. The gases are poisonous to fish and result in stress, or in unmanaged situations, death. Feeding fish a food they love and to the correct quantity will keep them happy and pond water healthy. The quality of pond water (which must not be confused by water clarity) has a big influence on how well Koi and goldfish will thrive in their environment. The health of fish is directly related to the correct balance of pH, dissolved oxygen, ammonia, nitrite and nitrate levels. These need to be carefully regulated – water hardness can also have an effect. Any rapid change will lead to stress. Example, fish seen gasping for air is a sign of a lack of oxygen in the water. Ammonia, nitrite and nitrate gases are toxic to fish if they are allowed to build up in a pond. Fish excrete ammonia as a by product of metabolism. Fish respiration uses up oxygen and nitrifying bacteria use oxygen to convert ammonia from fish waste. If oxygen levels are too low, the detoxification process slows. The result is a build-up of ammonia in the water. Dissolved oxygen levels can be maintained by reducing the number of fish (if there are too many per pond size) and installing a fountain, stream or water jet to aerate the water. Fish metabolism is sensitive to pH changes. They will tolerate a range of values on either side of neutral but not extreme changes. The ideal for a pond is between pH 6.8 and 8.0. Check the pH of the water at least once a week. Your fish maybe threatened by a visiting heron. If a predator visits in the early hours or at dusk you may not be aware of the threat to your fish and therefore why they are huddled at the bottom of your pond. Installin g deterrents such as a pond net will make your pond less attractive to predators. The sooner you are able to identify and stop predators attacking or threatening your fish, the sooner they will resume normal behaviour again. Koi don’t like rapid change. For example, a sudden drop in temperature of the water can cause them stress. A wet, cold summer may result in the pond water getting cold leading to fish going into partial hibernation or displaying other behavioural changes. They hover about at the bottom of the pond where the water is warmer, stop eating or rub their bodies on the side of the pond. Oxygen dissolves naturally in water. The temperature of the water determines how much oxygen will dissolve. The warmer the temperature, the lower the amount of oxygen. Koi seen jumping out of the water or moving about very rapidly, is a sign of oxygen deficiency in the water. A hot summer will lead to an increase in water temperature and a drop in oxygen levels. Install a fountain, artificial stream or plant oxygenating plants to maintain sufficient oxygen levels. Pond fish – Koi and goldfish are more active when the weather is warm so make the most of their vibrant personalities by reducing stress as much as possible. This entry was posted on August 14, 2018, in Garden ponds. Bookmark the permalink.